While all around I've not really read anything I haven't liked in Rebirth, 'Action Comics' has been the weakest of the two Superman titles. While 'Superman' has had a lot of heart and features some great moments between Clark and his son, 'Action' has just lacked a little more. We've went from a battle between Supes, Doomsday, & Lex Luthor, to him teaming up and rescuing Lex from an alien world. While these stories were fairly exciting in themselves, they didn't get me excited for the future and what was to come. Luckily that changed this week. One common thread that's been lingering for almost a year is who is this other, non-powered, seemingly non-Kryptonian running around? Something has been really off about him from the beginning and now Lois is determined to get to bottom of it. First off, this is one of the first issues in a LONG while in which we get to see Lois in her element; undercover and chasing a story. This is the Lois Lane we all know and love from some of the best Superman stories. So she's not going to take things lying down when fake-Clark gets in her crosshairs. In this issue there is even more intrigue that's added to this mystery and hopefully we'll only have to wait until the next issue to find out who this guy is. All the while, it feels that this story is leading directly to the next big Superman crossover, "Superman Reborn". The only downside to this issue is that if you haven't read, or are at least familiar with, what's been happening over in 'Superwoman', then Steel's appearance will feel a little jarring. This has been one of the biggest surprises for me from the beginning of Rebirth. 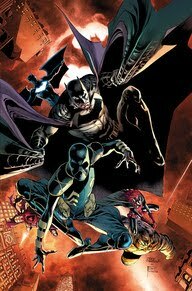 James Tynion IV has been able to create some great moments with Batman and his team while continuing some huge stories set up by his time with 'Batman & Robin Eternal'. The scope and scale of his stories in 'Detective' only grow each issue. Now that we've landed at a landmark 950th issue, Tynion gets to prep multiple, epic stories to be played out in 2017. The first story line is the "League of Shadows" which looks to be heavily tied to Orphan's mother. What links does she have to Ra's al Ghul and will this tie in at all to Damien's confrontations with him from 'Teen Titans'? While those questions aren't answered, what we do get is a great profile of Cassandra Cain, Orphan. Which is great for the reader because Orphan barely says two words to her team. It's a great look inside her head which will only pay off immensely if we're dealing with a story of her past and connection to the League. In the second story we have a great setup for a future Azrael story with him and Batwing. While there's a decent amount of exposition by Azrael here to familiarize us even more with the Order of St. Dumas, you start to get a feel for what these two will bring to the team. BTW, does anyone know what Batman is calling this team of his? JLB: Justice League Bat? The Legion of Bat People? Bat-Team? Someone get on that. In the third and final chapter of this issue, we get a flashback to a confrontation between Red Robin and Bats (hey, look, Batman is in this issue!). Red Robin has questions around what Batman is up to. Why he has Nightwing and Red Hood out in the field, why he's assembled this team in Gotham, and why he's assembling his own Justice League? He surmises that Batman is preparing for a war, but what war? Could this be connected to inevitable DC/Watchmen face-off? Or is there some other threat that Batman knows about that he isn't ready to share yet. It looks like we'll find out sometime this year. One of the other added bonuses of having an issue like this is seeing three different art teams and how their style lends itself to each story. While all three are great, I'm becoming more and more of a fan of Eddy Barrows, who was the opening artist in 'Detective Comics' since Rebirth.